Course Dates Choose an optionNov 27, 29, Dec 1-2, 2018 (Tue, Thu, Sat-Sun)Dec 5, 7-9, 2018 (Wed, Fri-Sun)Dec 11, 13, 15-16, 2018 (Tue, Thu, Sat-Sun)Dec 19, 21-23, 2018 (Wed, Fri-Sun)Jan 2, 4, 5-6, 2019 (Wed, Fri, Sat-Sun)Jan 9, 11-13, 2019 (Wed, Fri-Sun)Jan 23, 25, 26-27, 2019 (Wed, Fri, Sat-Sun)Jan 29, 31, Feb 2-3, 2019 (Tue, Thu, Sat-Sun)Feb 6, 8-10, 2019 (Wed, Fri-Sun)Feb 19, 21, 23-24, 2019 (Tue, Thu, Sat-Sun)Feb 27, Mar 1-3, 2019 (Wed, Fri-Sun)Mar 5, 7, 9-10, 2019 (Tue, Thu, Sat-Sun)Mar 19, 21, 23-24, 2019 (Tue, Thu, Sat-Sun)Mar 27, 29-31, 2019 (Wed, Fri-Sun)Apr 9, 11, 13-14, 2019 (Tue, Thu, Sat-Sun) Click here to clear options to view dates for all locations. We’re bringing avalanche education to you! Join us for our unique, convenient split course experience in either Boulder or Denver and let us accommodate your work schedule. This AIARE 1 Avalanche Education course will meet in the classroom for three hours Tuesday and Thursday evenings (in either Denver or Boulder) before reconvening in Estes Park over the weekend. The AIARE 1 Split Course is a four-day / 24-hour introduction to avalanche hazard management. Our instructor team is made of experienced AIARE instructors and professional mountain guides with decades of experience in avalanche terrain, from the Alps to Alaska to right here in Rocky Mountain National Park, one of the country’s premier winter adventure destinations. In addition to classroom work, our course includes field instruction each day to provide a well-rounded education to backcountry decision-making, trip planning, terrain selection, and companion rescue techniques. This course provides essential training for anyone traveling in avalanche terrain and can be taken on backcountry skis, split board, or snowshoes. With a maximum ratio of six students per instructor in a twenty seven-hour course, we exceed AIARE minimum standards to provide the highest level of instruction. Reasons Why CMS AIARE Courses Are Worth It! CMS is the countries largest AIARE Provider for a reason! 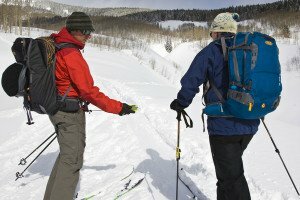 Get avalanche training in the ski venue you ski in locally. Neptune Mountaineering ski shop support with rentals of ski equipment.